To start the week just right I decided to write a personal Inspirational Monday that I hope will inspire many of you not to be scared to be yourselves! I was anything but myself for most of my life and I hated it! I am naturally what people call “quirky”. I say the wrong thing, I trip and fall, I have a weird humor and am extremely sarcastic. People didn’t really like me the way I am…or better said, the people I wanted to like me. Truth is, when I started actually being myself I made a lot of friends, real friends, whom I can count on, no matter what! Don’t pretend to be something you’re not, it will slowly kill you from the inside out and you’ll be utterly unhappy! 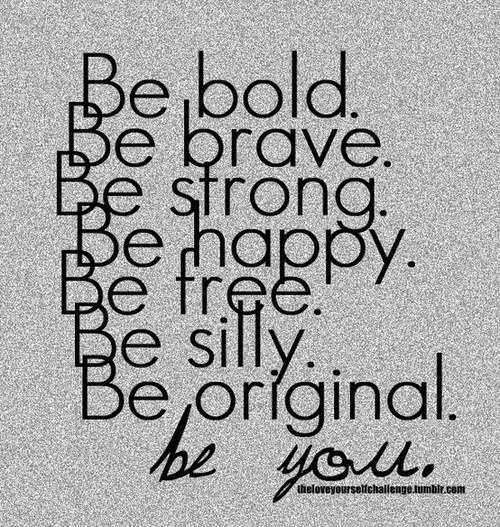 Plus, if you are yourself..people can like you for who you are and not for something else! Rosie Advises: Friendship between men and women? Previous Post Cozy Sunday: Favorite cuddle drink! Next Post Do you want to get to know me?